Description: The Shrike Woods are cryptids resembling either forests after a fire or dead forests infested with pine beetles. These suckers can get big, ranging from a radius 360 feet (110 meters) to 8 miles (13 kilometers), and if left unchecked could possibly grow larger. Its main body is some kind of spongy green sticky material that also acts as it’s digestive system, and coated all over the top part of it are dead, bark-like "tendrils". It uses these tendrils to catch any prey that happens to get too close, impaling them with its tendril and tossing them onto its body to absorb the victim. These tendrils can grow as high as a lodgepole pine, around 40-80 feet (12-50 meters). They look almost exactly like a dead pine tree, though they tend to have more branchless tendrils. They have no form of personal locomotion, thankfully, but they do naturally grow about half a foot per year. Background: We're not quite sure how far back they have been around for, but there are some theories which trace them to the Ice Age, although I personally don't put much stock in that. The evidence for this theory is interesting I suppose, albeit a bit farfetched. During our hunt in Canada, we decided to try head to a library and do research on the area to better see how long those "woods" have been around. Lumberjack-3 then called us over to show an article he found. It was about a cave that might have been a home to prehistoric humans, there were plenty of animals and other abstract paintings on the wall, though the real deal was one that was just assumed to be some abstract stuff they drew, it was a painting of what I think were humans chucking spears at a bunch of straight lines. I don't really know if this is as substantial of evidence though, but I will admit, the resemblance is there. The first recorded incident relating to these cryptids is hard to pin down. These … Shrike Woods, might have been responsible for several disappearances of Norman hikers, tourist, and campers. Our first encounter with the Shrike Forest was in the town of Lincoln, Montana. We decided after hearing reports of the actual forest taking Normans right off their feet, that we'd go and check it out. For the whole encounter refer to the Encounter Records, "Lumberjack report from first encounter." Location and Population: It’s currently unknown how many there are, though we have discovered ten Shrike Woods so far. They have been found all along the Rocky Mountains, from British Columbia in Canada all the way down to the top of Wyoming in the United States. The only outlier of that pattern is one near the Red Wood Forest in California, I still wonder why the hell this instance is not only miles away from where we think they thrive, but why this instance is the largest of them all? And on top of that, I wonder how these assholes reproduce. Cause you’d think they would do this with seeds, but they don’t have seeds or any indication of green on their tendrils; the only seemingly living green part is located on its spongy body. Hunting or Procurement Methods: It is highly recommended, if not necessary, to bring something to ignite it; Molotovs, gas cans, flamethrowers if you got them. Do this from a safe distance of about 45 feet, just so you don’t get impaled. Incendiary devices might work as well, although fire is the go-to method, since the resultant damage will most likely be attributed to a wildfire. If you want to get a sample of these beasts, then good luck, these things move fast and attack intruders with remarkable precision. Sampling is possible, however, a standard rover or other unmanned vehicle is recommended. + Lumberjack report from first encounter. - Lumberjack casualties from first encounter. When we did find one it was with my outfit, The Lumberjacks. We were investigating a possible lead on an aberrant; bunch of Normans claiming they saw their friends getting killed in the forest, standard aberrant talk. We decided to check if these claims were legitimate. We had a Red Ryder, Lumberjack-6, with us to get some experience. The reason I mention this is because when we stopped at the supposed area it was in, he tripped and landed face first on the aberrant. This startled it and it tried to swat at us with its tendrils. Lumberjack-5 got impaled and tossed onto it, while I got a nasty gash from when it just swiped at me. As I was on the ground holding my wound I saw one hell of a sight: not only were the bodies of the still screaming Red Ryder and the still corpse of that poor Warder stuck onto the Shrike Wood’s body, there were also two other human corpses on it, along with a deer, an elk, and a goddamn bear. We tried shooting it but that didn't really work too well, then all of the sudden one Warder grabbed a bottle of whiskey we'd saved for after the mission and made a Molotov out of it. Just chucked it at the trees, went up like a pile of wood with gasoline poured on it. While it was panicking with its tendrils reeling in pain, we managed to pry the Red Ryder out and booked it out of there. 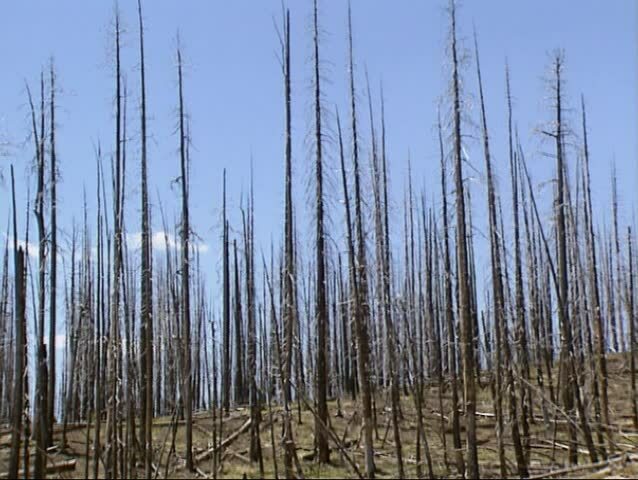 A bit of the forest went up in the blaze as well. I went back afterwards and all that was left of it was a deep, football field-wide indent in the ground. Lumberjack-1: Noticeable cut along the face from the Aberrant’s tendrils. Lumberjack-3: Fractured three ribs and major bruising after getting swatted by one the aberrant's tendrils. Lumberjack-4: Cut along the side of the torso, caused after a failed impalement from the aberrant's tendrils. Lumberjack-5: Deceased, cause of death: impalement. His body was not retrieved and has presumed to have been burned in the aftermath of the encounter. Lumberjack-6: Minor skin tearing after being pulled from the aberrant. Status: Active, reason is due to it residing on federal property. Additional Notes: After the discovery of Shrike-10, the Red Ryder; the one who got a face full of the Shrike Forest, started to act up, so we left back for our base in Montana. We discovered a few things as we examined the boy, one: he had green, spongy growths all over the parts that were exposed to the aberrant; two: we discovered that the growths were essentially eating him, and couldn't be pulled out since they were deeply rooted in his body; and three, we discovered how it reproduces. From my guess, if something somehow escapes the Shrike Forest after touching it, the animal or person gets, well, infected. It seems that it grows on the host until it consumes them whole and becomes another one of those woods. We didn't want to risk getting infected, so we isolated our Red Ryder in the shed. We were going to try and get the growths off of him in the morning, but it seems like it just grew faster during the night. It covered the poor boy's whole body, as well as the entire shed. He wasn't moving so we had to assume he was dead. We decided to burn the shed to prevent further infection. He was a good kid —an idiot, but a good kid. So just make sure you wear some protection over your body when hunting this, but if any gets on your skin, you're as good as dead.